There has been an UNID 1 PPS time tick ( or pip if you prefer ) transmitting between 10100 and 10150 kHz from time to time. A search online of reports of similar signals has found a few references including some from around the first of January this year of a similar signal on the lower end of 7 MHz. I have noted this signal mostly between 10100 and 10150 kHz but also have noted it on 7 MHz as well. Activity is intermittent, some times on the weekends, sometimes on weekdays but always during the day Eastern time on 10 MHz and when noted on 7 MHz in the evening. The signal appears to be synced with UTC (i.e. in step with WWV) but does not ID as does WWV nor does it change from a steady 1 PPS tick although I have on occasion thought that I have heard an occasional double tick. Each 1 PPS tick is 16ms in length with a very sharp rise and fall time giving it very harsh sound. This also gives it a rather wide bandwidth. The signal changes frequency from time to time but appears only frequencies divisible by 5 kHz, i.e. 10100, 10105, 10110, 10115 ... (etc). These are carrier frequencies and you would tune 1 kHz lower for USB or higher for LSB. I have not noted any obvious pattern to the frequency changes. It sometimes appears as though the signal will change frequencies if there happens to be an interfering signal nearby - almost like it changes to find a frequency with no interference or less likely changing to one where it will cause less interference. 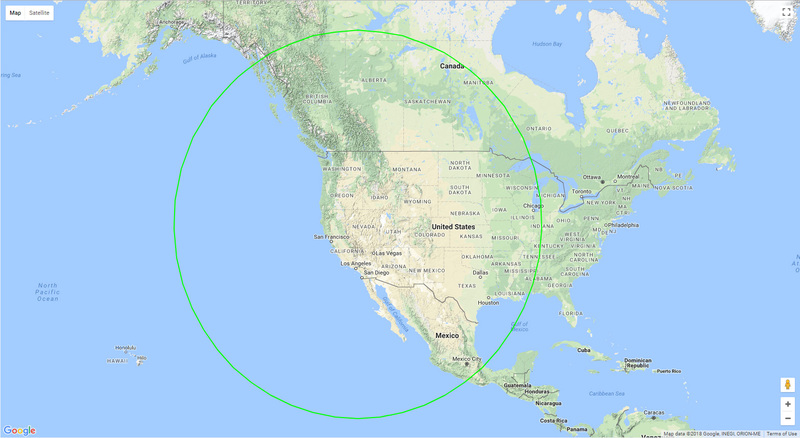 Assuming that the 1 PPS tick is synced to UTC and using simple time of arrival measurements, the origin is definitely in North America and an arc ( just over 1550 km) drawn from my location in Eastern Ontario includes northern Florida, central US and on up into Manitoba. I did not note this signal on this past weekend (March 10/11) nor yesterday ( Mar 12 ) but it was on this morning starting around 2018-03-13 12:30UTC and was active for about an hour and used 10100, 10110, 10120, 10125, 10130, and 10150 kHz. I have attached a screenshot from this morning when it was on 10130 kHz. You can see how strong a signal it was with reference to other nearby signals. Those around 10138 kHz are amateur digital signals likely JT65 or similar. Signal strength alone seems to indicate power levels greater than typical amateur radio use on 30m. I have been poking around the FCC and Industry Canada databases for licencees that might match but so far I haven't managed to look under the right rock. There is a US company, URSANAV which has been promoting eLoran as a supplement to GPS for timing purposes due to the recent interest in mitigating some of the spoofing issues being seen with using GPS only. I wonder if there is some commercial company testing out something else but on HF. Yes, this signal has been noted on these forums as well as others. A couple of points to add to your post. I have a video up on my Youtube channel of it on Jan 1, 2018, in the 40 meter band. Video here, ignore the part of me calling the pulse "about 20 msec long", I was rounding for description, not trying to measure the exact pulse width, which is, as you said, about 16 msec long. But the leading edge to leading edge timing is correct. The signal has appeared on up to 5 frequencies in sequence, and it has been seen on as few as one frequency during a given time period. When on multiple frequencies the frequencies are not transmitted simultaneously, but rather they are sequenced, freq 1, then freq 2, then freq 3, then freq 4, and back to freq 1 to restart the cycle. Now, if we could overlay your circle, my circle, and a third parties circle we might narrow down the location a bit. Better yet, instead of assuming the pulses start at UTC T0 we could just use TDOA and arrive at a location regardless of true start time of the pulse. You have to be careful with that assumption of start of pulse timing. While the first pulse sent may, or may not, start on UTC T0, the other pulses, when in multi freq operation, have some kind of delay in them. Each pulse is, as you said, 16 msec long, so you would expect P1 (pulse 1, or freq 1) to be at UTC T0, P2 (pulse 2, or freq 2) at T0 +16 msec, P3 to be at T0+32 msec, P4 to be at T0+48 msec, etc. But what really appears to happen is that each following pulse is delayed by the pulse width plus some time delay. So the P1 starts at T0, the P2 at T0+40 msec, P3 at T0+80 msec, P4 at T0+120 msec. The following pulse is sent with the pulse duration delay of the proceeding pulse, 16 msec, plus a delay of about 24 msec. What is odd about this signal, to me, is the fact it appears to only happen in ham bands (so far I have only seen it in 40 and 30 meters) but it appears to not be ham related and appears to be running well over ham power levels. I have simultaneously heard it (using remotes) from the western Pacific to Eastern Europe, on 40 meters. Not impossible at ham power levels, but not normal either. was noted on 10115, and 10150 earlier. The UNID 1 PPS time tick was active this morning for about an hour between 2018-03-14 12:10 and 13:10 UC and was observed on 10115, 10150, 10120, and 10135 kHz. Yes indeed, it is a BIG assumption that this signal is synced to UTC and in reality at the moment is just a working theory. True time of arrival comparisons at a number of different locations is what is needed, either that or widespread system of DF sites. I had earlier found one of Token's earlier posting of his Google Map with circle. I converted to a simple Google Earth KML file (I use Google Earth a lot) which gave me the ability to plot that data with my own (see attached .jpg). I have not noted this signal to be on more than frequency at a time and any time it changed frequency it never appeared to in any obvious sequence. For all intents and purposes it looks just like it changes frequency and carries on the new one. Perhaps I am just not looking close enough. Indeed, so far seems to be only on amateur frequency allocations, 30 and 40 meters. However, 30 meters is a secondary to amateur radio assignment and in some countries so are parts of 40 meters. I have been experimenting with and refining my setup for taking measurements and am ready to try some time of arrival tests. I have experimented using online SDR's but they are susceptible to unpredictable delays and other skewing, even using an SDR on a PC can have it's uncertainties if care is not taken. this mystery UNID 1 PPS time tick has not been heard, at least at my location, since March 14th nor have I stumbled across any recent postings in any other online forum. It may have moved to some other frequency but my searches have not found it or it may have just ceased operating. There have been periods in February where I have not noted this activity for just a bit more than a week but not as long as nearly two weeks. the UNID 1 PPS time tick appears to be on again. currently on 10105 kHz (carrier frequency - tune 1 kHz low for USB or 1 kHz high for LSB). Started sometime in the last half hour or so. Not as strong as usual this morning, possibly just due to propagation. Local signal strength is stronger than this morning. I could not hear this signal on a web sdr in Edmonton Alberta but I could on Token's online sdr in the Mojave desert. Earlier I was only able to monitor visually remotely. A poster on the UDXF groups.io group mentioned that the tick was irregular today. When I had a chance to monitor live this evening it was indeed irregular - no were near the previous monotonous once per second tick tick tick. Indeed, very irregular, some time three ticks close together over a period of second or so, sometimes pauses longer than a second and certainly not in step WWV. I did not note any discernible pattern After listening for an hour or so. There were no noted frequency changes today either. This interesting UNID has taken another interesting twist. forgot to mention, I measured a few of pips and they were are consistently 16ms in length as was measured on previous occasions. Indeed, apparently random and inconsistent - definitely not the same consistent repetitive tick tick tick that was earlier noted. Pulse width and shape was what I have measured in the past - 16ms pulse width with a sharp rise and fall. When able, I listened on an off for over an hour and did not note any obvious pattern. Kind of reminiscent of the radio signal in the 1959 movie "On the Beach". I think there was something similar in "Ice Station Zebra". the mystery it seems, has taken on yet another twist. errr.. make that 7125 kHz. It has been actively jumping around. no noted pattern to when and to what frequency other than it is maintaining it's usual preference to 5 kHz frequencies i.e. 7100, 7105, 7110 .... (etc). typical behaviour as noted on 30m (101xx kHz), appears as a steady 1 PPS, very strong signal strength in Eastern Ontario, changes frequencies from time to time but always on some multiple of 5 kHz i.e. 7100, 7105, 7110 (etc). Lowest frequency noted tonight was 7100 and highest was 7300 kHz. I did notice something unusual tonight. When on 7165 around 23:30, I noted several pips on 7300 which were out of sync of those on 7165. Image attached shows this, yellow box identifies the noted time period and a narrow yellow line (hopefuly visible on the attached image) showing that the pip on 7165 was not in sync with the pip on 7300. I had not noted this previously on 30m but (Token I think) was noted sometime ago on a posting regarding similar activity on 40m around the first of the year. I found this one on 7.28505 MHz, is this what you are hearing? the main 1 PPS is still on 7285kHz BUT I am also seeing pips every three seconds on frequencies above and below 7285kHz. 7200, 7320, 7440, 7560, 7680, 7800, and 7920. I did not notice anything above 7920, between 7285 and 7200 nor below 7200. Pulse width on 7285kHz is 16ms and on the other frequencies, at least on 7200 and 7320 kHz where I measured, was 128ms which is the main PIP's width x 16. These were measured using a recording and measuring using Audacity. Image attached showing some details. Still going as of 2018-04-11 15:39. Now I am off to check some of the frequencies noted by Token in his report of his Ditter network.